Eliminating food insecurity – commonly referred to as “hunger” – is one of the greatest challenges of our time. Food security exists when all people, at all times, have physical and economic access to sufficient, safe and nutritious food that meets their dietary needs and food preferences for an active and healthy life. Even in as prosperous a country as the U.S., hunger still exists. In response to this problem, some communities have developed Hunger Free Community Coalitions. A Hunger Free Community Coalition is a group of individuals from multiple sectors who come together to address the causes and factors relating to food insecurity in their communities through a collective impact approach. They develop and implement policies and programs to combat food insecurity and monitor responsiveness of existing services. 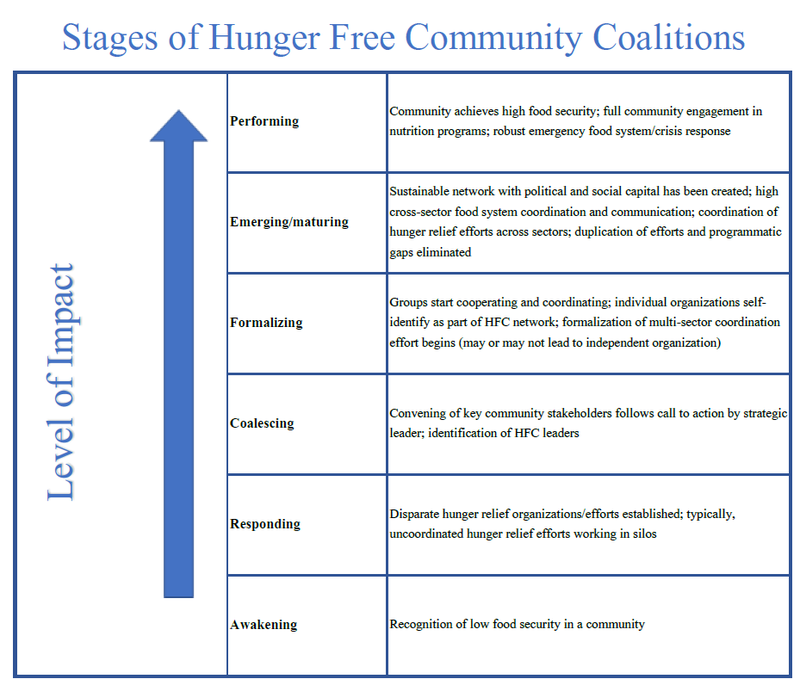 Ideally, hunger-free community coalitions include low-income individuals as advisors, as they will be able to provide unique perspectives on hunger in their communities. The Hunger Free Communities Network™ is an initiative of the Alliance to End Hunger that brings these separate coalitions together for the purpose of sharing information, identifying common challenges and best practices, providing resources and building the capacities of these coalitions to create hunger free communities. There are two conditions for joining the Hunger Free Communities Network™. 1). Coalitions should be multi-sector including representatives from nonprofit, public, private and/or faith communities. Ideally, coalitions have representatives from all parts of the local food system, as well as, community stakeholders. 2). Coalitions should have a goal of significantly reducing food insecurity or becoming hunger free. Coalitions go by many names and need not use the “hunger free” terminology to be part of our network. Newly forming or established coalitions are invited to join the Hunger Free Communities Network™ at any time. Q: Where did the term “hunger free” community originate? A: In 1992, the House Select Committee on Hunger, chaired by Rep. Tony Hall (D-OH) (now Executive Director Emeritus of the Alliance to End Hunger) released a resolution outlining 14 actions steps for creating Hunger Free Communities. The steps included suggestions such as coordinating emergency food services, engaging low-income participants in policy and program development, utilizing federal nutrition programs, increasing access to nutritious foods and reducing food waste. See the resolution here. Q: What is collective impact, and why should a collective impact approach be used? A: Collective impact is an important principle of hunger free coalitions. It refers to the commitment of a group of important actors from different sectors (government agencies, nonprofits, businesses, faith organizations, etc.) to a common agenda for solving a specific social problem. While single-service programs may be useful for addressing simple problems, a collective impact approach is more effective at address complex social issues such as hunger. Q: If I want to form a Hunger-Free Coalition, where do I start? Decide where you want to serve. It is best to start your HFC in a community where existing resources might easily be mobilized to lead to an early success. A victory early in the formative stage of the coalition’s development builds enthusiasm, confidence, and momentum to fuel the coalition as it grows to include more challenging communities. Demonstrating results and using momentum to expand and replicate the effort is the best strategy for sustainability. Identify key partners. Identify people who would be good “anchor” members of your coalition. These are well-recognized individuals or organizations within the community that are respected and have good leadership skills. Look to include people from multiple sectors. Ask for their support. Get organized. Once you have at least a few people on board, organize your first meeting and come up with a detailed agenda. You may wish to discuss the extent of hunger in the community, existing hunger-relief resources, potential strategies for improving current resources and creating new programs, and how your coalition plans to move forward. Keep up the momentum. Don’t forget to follow-up and schedule additional meetings. Build up a strong leadership team and keep reaching out to other individuals and organizations that might want to help. Publicize – make sure people know you exist! Lastly, remember to set up a shared measurement system for tracking your coalition’s progress. Q: As I move forward, how do I evaluate how my Hunger Free Coalition is doing? A: The Alliance to End Hunger has developed the following stages of development for Hunger Free Communities. This can be used to identify and guide your coalition’s progress. To help your coalition move towards greater impact, you can conduct an evaluation using our Self-Assessment Workbook (SAW). The Alliance to End Hunger developed this resource to help coalitions with strategic planning, self-evaluation, and building group cohesion. You can find the Self-Assessment Workbook and more detailed instructions for its use by clicking here. Q: Do we already have to be a multi-sector coalition to join the Hunger Free Communities Network? A: No, but you do have to have the want or intention to form a coalition. We can assist you with the formation of one. Q: How do we join the Hunger Free Communities Network? A: First, you need to submit an application form (found here). If we feel you are a good candidate, we will contact you within 1 week to set up a call to discuss a potential partnership. Q: How will joining the Hunger Free Communities Network benefit us? A: There are numerous benefits to joining the Hunger Free Communities Network. Your coalition will be identified on our HFC Map and introduced to a national network, including Alliance to End Hunger member organizations, potential funders, potential volunteers and more. We foster communication and facilitate mentorships between coalitions, host webinars and trainings, provide access to our extensive resource library, provide technical assistance, and invite all our coalitions to our events, including an annual dinner and annual Hunger Free Communities Summit. Q: Is there any cost to joining the network? A: No. Our goal is to help you reduce hunger in your community. We require a simple agreement and recognition as a Hunger Free Communities Network™ partner on your website. Q: How do I ask questions or get more information? A: Minerva Delgado, Director of Coalitions & Advocacy leads our Hunger Free Communities initiative with the support of Sarah Peterson, AmeriCorps VISTA. Please email HFC@alliancetoendhunger.org with your inquiries.